Jill Miller’s Yoga Tune Up programme is used all over the world as a gentle but wonderfully effective way of relieving muscle tension and building strength. 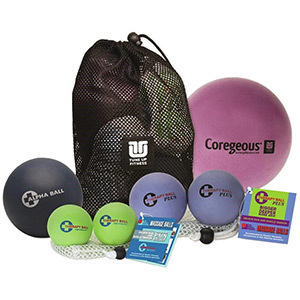 It combines techniques from yoga with uniquely designed therapy balls that allow you to use your body weight to work out muscle tension and give yourself a deep tissue massage. Jill has further developed her wonderful exercise programme into the Roll Model Method. This aims to help you conquer pain and stress and allow you to feel comfortable and confident in your body again. The Roll Model Starter Kit contains all the massage balls you need to get started on your Yoga Tune Up journey. What’s included in your kit? The balls that started it all, these measure 2.5 inches in diameter and provide about the same type of pressure as a thumb. Their special rubber material can grip your skin, enabling them to grab multiple layers of muscle and provide a deep tissue massage. They come in their own drawstring bag for easy storage. Measuring 2.75 inches, these therapy balls provide the same level of pressure as an elbow. They can cover a bigger surface area than the original balls and obtain a greater depth of pressure. Their net storage bag can be used to keep the balls together during treatment for double the relief! These are great for spine rolls and to treat the IT band and thighs. This is the largest solid Roll Model ball, measuring 3.5 inches. It provides the same pressure as a fist and can cover large areas of muscle mass with unparalleled grip. Excellent for the pecs, buttocks and hips. You can place it against a wall and roll it along your chest, shoulders, lower back or hips – it has a soft outer layer and dense inner core that feels amazing! Perfect for a gentler session, this inflatable massage ball measures 9 inches and has a soft and stretchy surface. It can be used to massage and activate your core muscles. It provides the same pressure as an open hand and can be used to safely reach your inner abdominals to help you overcome weakness and injuries. Made with durable and breathable netting material, this drawstring tote is roomy enough to hold all your therapy balls for easy storage and transportation. It features a handy strap so that you can carry it over your shoulder for training on the go. The inbuilt zipper pouch can hold cash, cards, phones and more so it’s all you need for the gym!